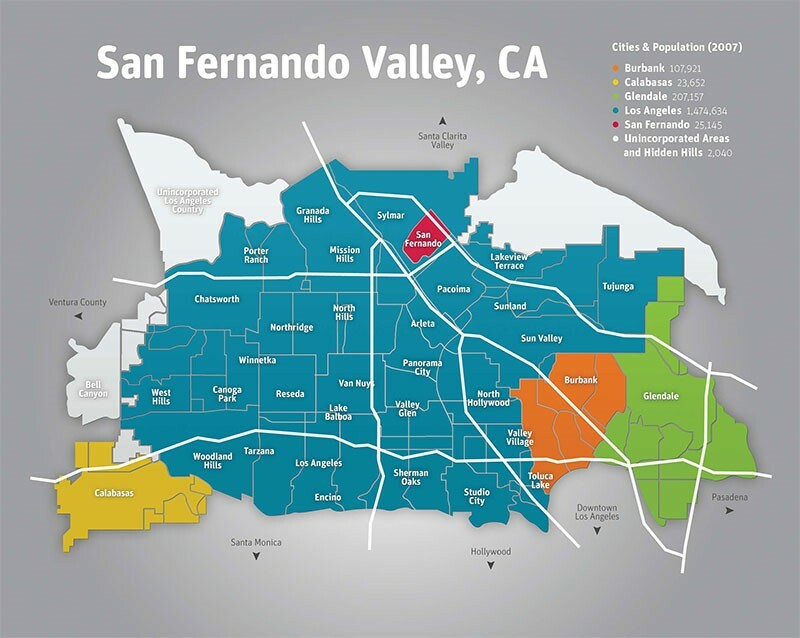 (2016)++^^ - Map showing the 38 communities located in San Fernando Valley. In 1900, there was still less than 3,000 people in the whole San Fernando Valley. The Valley's population today is nearly 1.8 million, larger than every other U.S. city except New York, Chicago, Houston, and of course, the rest of Los Angeles. ARLETA – The name Arleta is a Celtic baby name. In Celtic the meaning of the name Arleta is: An oath. In the 1960s, residents in the more affluent, western half of the Pacoima successfully led a petition to break ties with that community and become an independent neighborhood. They named it Arleta, which was officially recognized as an independent community in 1968. BELL CANYON – Named for Charles Bell, Calabasas Justice of the Peace. Although it is not part of the city of Los Angeles, Bell Canyon falls within the boundaries of the San Fernando Valley. In 1850 Miguel Leonis, took Espiritu, the daughter of a Chumash chief Odón Eusebia, as his wife and moved to the base of Castle Peak. When Leonis died, he left only a small portion of his estate to Espiritu, who retained lawyer Horace Bell to acquire the whole of the estate. As payment for legal services rendered, Espiritu gave Bell some of the land. Bell's son Charles, also a lawyer and Calabasas Justice of the Peace in 1906, later built his home there. The community of Bell Canyon derives its name from Charles. BURBANK - The city was named after David Burbank, a New Hampshire-born dentist and entrepreneur who established a sheep ranch there in 1867. Dr. David Burbank purchased over 4,600 acres of the former Verdugo holding and another 4,600 acres of the Rancho Providencia in 1867 and built a ranch house and began to raise sheep and grow wheat on the ranch. He eventually became known as one of the largest and most successful sheep raisers in southern California, resulting in him stopping his practice of dentistry and investing heavily in real estate in Los Angeles. CALABASAS - It is generally accepted that Calabasas as the city name is derived from the Spanish calabaza meaning "pumpkin," "squash," or "gourd". Some historians hold the theory that Calabasas is a translation of the Chumash word calahoosa which is said to mean "where the wild geese fly." Owing to vast presence of wild squash plants in the area, the squash theory is more prevalent among local residents. CANOGA PARK - Originally named Owensmouth to evoke an image of being at the mouth of the distant Owens River, the town was renamed Canoga Park in 1931. When the Southern Pacific built a branch line through the area, it designated the spot Canoga, after the town of Canoga, New York, which in turn took its name from the Indian village of Ganogeh ("place of floating oil"). In 1931, Owensmouth became Canoga Park. (The Post Office insisted on adding "Park" to avoid confusion with Canoga, New York). CHATSWORTH – Originally the town of Chatsworth Park, the name came from Chatsworth House, the family seat of the Duke of Devonshire in Derbyshire, United Kingdom. The Devonshire name was also used for the naming of the major east-west boulevard. ENCINO - In 1769, the Portola Expedition reached the San Fernando Valley and saw many live oaks. They named it “El Valle de Santa Catalina de Bononia de Los Encinos” (The Valley of St. Catherine of Bononia of the Oaks). The area became the Encino land grant in 1840. Encino means “Oak”, for which the name of the community was named after. GLENDALE – An anglicised version of the Gaelic Gleann Dail, which means valley of fertile, low-lying arable land; the name originated in Scotland. Glendale incorporated in 1906, and annexed Tropico 12 years later. GRANADA HILLS - Founded in 1926 as "Granada;" the "Hills" portion of the name was added 15 years later. It was named after a town in Spain that has a very similar climate and topography to the north San Fernando Valley. The community began as dairy farm and orchard known as the Sunshine Ranch which grew apricots, oranges, walnuts and beans. Vestiges of former citrus groves can still be seen in orange, lemon or grapefruit trees in many residential yards. In 1916, the San Fernando Valley's first oil well was drilled in what is now Granada Hills. The oil well was located at the northern tip of Zelzah Avenue. In 1917, Oklahoman oil magnate J. H. Mosier purchased 4100 acres of the Porter Ranch from George K. Porter and renamed it Sunshine Ranch. Between 1917 and 1924 over 2000 acres of the ranch were planted with citrus trees. In 1925 the land was sold to Suburban Estates, Inc. and shortly thereafter they subdivided the real estate into residential and commercial lots. The first home and commercial building was built in 1926. At this time the area was still known as Sunshine Ranch. LAKE BALBOA - Before being recognized in 2007, Lake Balboa was referred to as Van Nuys. The new neighborhood name was created to improve property values. Lake Balboa is the namesake of the Lake Balboa nieghborhood. The lake is situated in Lake Balboa Park, or Anthony C. Beilenson Park — an 80-acre recreation facility in the Sepulveda Basin Recreation Area, named for Anthony C. Beilenson. The centerpiece of the park is the 27 acres Lake Balboa, filled with water from the Tillman Water Reclamation Plant. LAKE VIEW TERRACE – Home to Hansen Dam, Lake View Terrace is a quiet equestrian community with two distinct faces: town and country. The east side is urban and densely populated, while the west has a rural feel, with homes zoned for horse-keeping and agriculture. MISSION HILLS – Named for the San Fernando Mission. Founded by father Fermín Lasuén on September 8, 1797 in Mission Hills, Mission San Fernando Rey de España (originally La Misión del Señor Fernando, Rey de España) is located on the former settlement of Encino Rancho. It was the seventeenth mission built in Alto California. NORTH HILLS - North Hills was originally an agricultural community known as Mission Acres. After World War II, the newly developed suburban community was renamed Sepulveda until the late 1990s. NORTH HOLLYWOOD – Was established by the Lankershim Ranch Land and Water Company in 1887. It was first named Toluca before being renamed Lankershim in 1896 and finally North Hollywood in 1927. West Lankershim (more or less today's Valley Village) agreed to be annexed to the City of Los Angeles in 1919, and Lankershim proper in 1923, to gain access to the new water source from the LA Aqueduct. Much of the promised water delivery was withheld or delayed, and many of the ranchers one by one had their holding foreclosed or transferred to the local fruit packing companies. In turn, these were bought up by the real-estate developers and by the late '20s a massive effort was underway to market the area to prospective home owners throughout the country. As part of this effort, in 1927, in an effort to capitalize on the glamour and proximity of Hollywood, Lankershim was renamed "North Hollywood". The result was a massive development of housing which transformed the area into a suburban development of Los Angeles. NORTHRIDGE - Once known as Zelzah, the location was renamed "North Los Angeles" in 1933. In 1938, the name changed again to Northridge Village and promptly shortened to Northridge. The name "Northridge" was used because the location of the community lay along the northern ridge of the San Fernando Valley. PACOIMA - Supposdedly a Tongva (Gabrielino) word meaning "running water” (There are differences of opinions on this name origin). In 1887, Jouett Allen purchased 1,000 acres of land between the Pacoima Wash and the Tujunga Wash. He chose the name that had long been applied to the beautiful canyon on the north and the “river” that flowed down from it. The land was purchased from the Maclay Rancho Water Co. which had taken over Senator Charles Maclay’s holdings in the Valley. Allen retained 500 acres for himself and subdivided the remainder in 1-acre tracts. From this the town of Pacoima was born. Pacoima was renamed 'Mulholland' in 1912 to take advantage of William Mulholland's popularity. It was hoped that the name change would give a boost to the area's development. But that only lasted for one year before the name reverted back to Pacoima. PANORAMA CITY - Was created in 1947 by developer Fritz Burns from the old Panorama Ranch, a dairy and sheep ranch. It was developed as a planned community by industrialist Henry J. Kaiser (the first planned community on the West Coast). PORTER RANCH – Named for the ranch owned by Benjamin F. Porter. In 1874, Charles Maclay bought 56,000 acres of the Rancho Ex-Mission San Fernando land grant including the northern half of the San Fernando Valley. In 1882, cousins George K. Porter and Benjamin F. Porter each received one-third of the total land. Benjamin F. Porter’s land became Chatsworth and Porter Ranch. Porter Ranch was the last community in the San Fernando Valley to join the City of Los Angeles (1965). RESEDA – Named after a fragrant North African yellow-dye plant, Reseda odorata, whose English name is mignonette and which grows in hot, dry climates. Reseda replaced Marian as a designation for a stop on the Pacific Electric interurban railway running along Sherman Way. The name "Reseda" was given first to a siding on a branch of the Southern Pacific Railroad in the south San Fernando Valley. SAN FERNANDO - Was named for the nearby Mission San Fernando Rey de España (which in turn was named after St. Ferdinand), and was part of the Mexican land grant of Rancho Ex-Mission San Fernando. In 1874 Charles Maclay, San Fernando founder, bought 56,000 acres of the Rancho. In 1882, cousins George K. Porter and Benjamin F. Porter of future Porter Ranch each received one-third of the total land. SHERMAN OAKS – Named for developer Moses Sherman. Sherman Oaks was one of the first Valley communities to experience intensive real estate development. Anticipating the development of the Los Angeles Aqueduct in 1913, Los Angeles Suburban Homes Co. purchased 47,500 acres of the southeast Valley in 1910. In 1911, a subdivision map called Tract 1000 was filed with Los Angeles County. From that parcel, one of the partners in the company, General Moses Sherman, bought 1,000 acres for himself. In 1927, Sherman subdivided the property and sold the land for $780 an acre. Moses Sherman just happened to be on the Board of Water Commissioners at the time and is said to have had inside information on the proposed route of the new LA Aqueduct. As part of his speculation in purchasing the southern San Fernando Valley in 1910, Sherman retained an interest in the neighborhood of Sherman Oaks, which continues to bear his name to this day. The street Sherman Way, running east-west from West Hills to Burbank in the San Fernando Valley remains (though it covers only half of the original grand highway). Hazeltine Avenue, which runs north-south from Sherman Oaks to Panorama City, was named after Moses Sherman's daughter, "Hazeltine". STUDIO CITY - Named after the studio lot that was established in the area by film producer Mack Sennett in 1927, now known as CBS Studio Center. SUN VALLEY – The area once had a general store named Roberts Store, and the town was named Roberts until the 1890s when the name was changed to Roscoe (for which Roscoe Boulevard was named after). The current name of Sun Valley was chosen in 1950 by a vote of local residents. SUNLAND – Sunland began life as Monte Vista in 1885, when 2,200 acres of the Tejunga [sic] Park tract were divided into lots ranging from five to 40 acres. One of the first uses of the new tract was the planting of 40 acres of olives, which made it the largest olive orchard in Los Angeles County. In 1887 the Monte Vista Hotel was being served by the Sunland Post Office. Most of today's Sunland was annexed to the city of Los Angeles, effective in 1926 and the remaining parts by 1932. Though Sunland and Tujunga began as separate settlements, they are today linked through a single police station, branch library, neighborhood council, chamber of commerce, City Council district, and high school and various civic organizations. The merging of these communities under a hyphenated name goes back as far as 1928. TOLUCA LAKE – Started out as Forman Toluca Ranch, a ranch known for its crops of peaches, apples and walnuts. In 1893, a petition was filed with the U.S. Postal Service for the area's first post office, to be named "Toluca Post Office.” General Charles Forman, a wealthy local landowner and one of the proponents of the petition, later stated that he had chosen the name "Toluca" from a Paiute word meaning "fertile" or "beautiful" valley. In 1923, investors bought and developed the land as "Toluca Lake Park". This initial venture failed, but a new group soon took over, renaming the development company "The Toluca Lake Company". With a "vision of creating a first 'bedroom community' for Los Angeles in the San Fernando Valley", the company formally changed the name of the community to simply Toluca Lake and adopted as their logo the "swan on rippled water" image still associated with the community today. TUJUNGA - In 1840 the area was part of the Rancho Tujunga Mexican land grant, but later developers marked off a plot of land known as the Tejunga Park, or the Tujunga Park, Tract. The name Tujunga is assumed to have meant "old woman's place" in the extinct Tongva language, where Tuhu "old woman" is a term for Mother Earth in Tongva mythology. VALLEY GLEN – Originally part of Van Nuys and North Hollywood, Valley Glen was officially recognized by the City of Los Angeles in 2004. VAN NUYS – The town was founded in 1911, and named for Isaac Newton Van Nuys, one of its developers and son-in-law of Isaac Lankershim. It was annexed by Los Angeles in 1915, after completion of the Los Angeles Aqueduct, providing it with the water required for further growth. Van Nuys was the first new stop on the San Fernando Line of the Pacific Electric Railway red cars system, which boosted its early land sales and commercial success. WARNER CENTER – Named for Harry Warner, the eldest of the Warner Brothers, owned this land since the 1940s which he used as a horse ranch. His family donated 20 acres of land in 1967 that became the Warner Center Park (also known as the Warner Ranch Park). WEST HILLS – Originally part of Canoga Park, was established as an independent community in 1987. The name ‘West Hills’ was chosen because it was the same name that a 303-home subdivision in a nearby unincorporated area had carried for years. WINNETKA - Charles Weeks created a small farming community named Weeks Poultry Colony in what is now the Winnetka area of the San Fernando Valley. In 1934, that neighborhood was named Winnetka after Weeks' former hometown, Winnetka, Illinois. WOODLAND HILLS – Originally the town of Girard, it was renamed Woodland Hills in 1945. Victor Girard Kleinberger bought 2,886 acres in the area from Chandler's group and founded the town of Girard in 1922. He sought to attract residents and businesses by developing an infrastructure, advertising in newspapers, and planting 120,000 trees. His 300 pepper trees forming an arch over Canoga Ave. between Ventura Boulevard and Saltillo St. are Los Angeles Historic-Cultural Monument #93 in 1972. The community of Girard was eventually incorporated into Los Angeles, and in 1945 it became known as Woodland Hills.